This article is about the type of war. 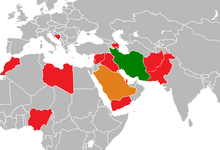 For a list of proxy wars, see List of proxy wars. Not to be confused with proxy fight. A proxy war is an armed conflict between two states or non-state actors which act on the instigation or on behalf of other parties that are not directly involved in the hostilities. In order for a conflict to be considered a proxy war, there must be a direct, long-term relationship between external actors and the belligerents involved. The aforementioned relationship usually takes the form of funding, military training, arms, or other forms of material assistance which assist a belligerent party in sustaining its war effort. During classical antiquity and the Middle Ages, many non-state proxies were external parties which were introduced to an internal conflict and aligned themselves with a belligerent in order to gain influence and further their own interests in the region. Proxies could be introduced by an external or local power and most commonly took the form of irregular armies which were used to achieve their sponsor's goals in a contested region. Some medieval states such as the Byzantine Empire used proxy warfare as a foreign policy tool by deliberately cultivating intrigue among hostile rivals and then backing them when they went to war with each other. Other states regarded proxy wars as merely a useful extension of a preexisting conflict, such as France and England during the Hundred Years' War, both of which initiated a longstanding practice of supporting piracy which targeted the other's merchant shipping. The Ottoman Empire likewise used the Barbary pirates as proxies to harass Western European powers in the Mediterranean Sea. Since the early twentieth century, proxy wars have most commonly taken the form of states assuming the role of sponsors to non-state proxies, essentially using them as fifth columns to undermine an adversarial power. This type of proxy warfare includes external support for a faction engaged in a civil war, terrorists, national liberation movements, and insurgent groups, or assistance to a national revolt against foreign occupation. For example, the British partly organized and instigated the Arab Revolt to undermine the Ottoman Empire during World War I. Many proxy wars began assuming a distinctive ideological dimension after the Spanish Civil War, which pitted the fascist political ideology of Italy and National Socialist ideology of Nazi Germany against the communist ideology of the Soviet Union without involving these states in open warfare with each other. Sponsors of both sides also used the Spanish conflict as a proving ground for their own weapons and battlefield tactics. During the Cold War, proxy warfare was motivated by fears that a conventional war between the United States and Soviet Union would result in nuclear holocaust, rendering the use of ideological proxies a safer way of exercising hostilities. The Soviet government found that supporting parties antagonistic to the US and Western nations was a cost-effective way to combat NATO influence in lieu of direct military engagement. In addition, the proliferation of televised media and its impact on public perception made the US public especially susceptible to war-weariness and skeptical of risking American life abroad. This encouraged the American practice of arming insurgent forces, such as the funneling of supplies to the mujahideen during the Soviet–Afghan War. A significant disparity in the belligerents' conventional military strength may motivate the weaker party to begin or continue a conflict through allied nations or non-state actors. Such a situation arose during the Arab–Israeli conflict, which continued as a series of proxy wars following Israel's decisive defeat of the Arab coalitions in the 1948 Arab–Israeli War, the Six-Day War and the Yom Kippur War. The coalition members, upon failing to achieve military dominance via direct conventional warfare, have since resorted to funding armed insurgent and paramilitary organizations, such as Hezbollah, to engage in irregular combat against Israel. Additionally, the governments of some nations, particularly liberal democracies, may choose to engage in proxy warfare (despite military superiority) when a majority of their citizens oppose declaring or entering a conventional war. This featured prominently in US strategy following the Vietnam War, due to the so-called "Vietnam Syndrome" of extreme war weariness among the American population. This was also a significant factor in motivating the US to enter conflicts such as the Syrian Civil War via proxy actors, after a series of costly, drawn-out direct engagements in the Middle East spurred a recurrence of war weariness, a so-called "War on Terror syndrome". Nations may also resort to proxy warfare to avoid potential negative international reactions from allied nations, profitable trading partners, or intergovernmental organizations such as the United Nations. This is especially significant when standing peace treaties, acts of alliance, or other international agreements ostensibly forbid direct warfare: breaking such agreements could lead to a variety of negative consequences due to either negative international reaction (see above), punitive provisions listed in the prior agreement, or retaliatory action by the other parties and their allies. In some cases, nations may be motivated to engage in proxy warfare due to financial concerns: supporting irregular troops, insurgents, non-state actors, or less-advanced allied militaries (often with obsolete or surplus equipment) can be significantly cheaper than deploying national armed forces, and the proxies usually bear the brunt of casualties and economic damage resulting from prolonged conflict. Another common motivating factor is the existence of a security dilemma. Leaders that feel threatened by a rival nation's military power may respond aggressively to perceived efforts by the rival to strengthen their position, such as military intervention to install a more favorable government in a third-party state. [clarify] They may respond by attempting to undermine such efforts, often by backing parties favorable to their own interests (such as those directly or indirectly under their control, sympathetic to their cause, or ideologically aligned). In this case, if one or both rivals come to believe that their favored faction is at a disadvantage, they will often respond by escalating military and/or financial support. If their counterpart(s), perceiving a material threat or desiring to avoid the appearance of weakness or defeat, follow suit, a proxy war ensues between the two powers. This was a major factor in many of the proxy wars during the Cold War between the US and USSR, as well as in the ongoing series of conflicts between Saudi Arabia and Iran, especially in Yemen and Syria. Proxy wars can have a huge impact, especially on the local area. A proxy war with significant effects occurred between the United States and the USSR during the Vietnam War. 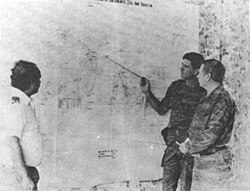 In particular, the bombing campaign Operation Rolling Thunder destroyed significant amounts of infrastructure, making life more difficult for North Vietnamese citizens. In addition, unexploded bombs dropped during the campaign have killed tens of thousands since the war ended, not only in Vietnam, but also in Cambodia and Laos. Also significant was the Soviet–Afghan War, which cost thousands of lives and billions of dollars, bankrupting the Soviet Union and contributing to its collapse. The proxy war in the Middle East between Saudi Arabia and Iran is another example of the destructive impact of proxy wars. This conflict has resulted in, among other things, the Syrian Civil War, the rise of ISIL, the current civil war in Yemen, and the reemergence of the Taliban. Since 2003, more than 500,000 have died in Iraq. Since 2011, more than 220,000 have died in Syria. In Yemen, over 1,000 have died in just one month. In Afghanistan, more than 17,000 have been killed since 2009. In Pakistan, more than 57,000 have been killed since 2003. In general, the lengths, intensities, and scales of armed conflicts are often greatly increased when belligerents' capabilities are augmented by external support. Belligerents are often less likely to engage in diplomatic negotiations, peace talks are less likely to bear fruit, and damage to infrastructure can be many times greater. ^ Osmańczyk, Jan Edmund (2002). Encyclopedia of the United Nations and International Agreements. Abingdon: Routledge Books. p. 1869. ISBN 978-0415939201. ^ a b c d e Hughes, Geraint (2014). My Enemy's Enemy: Proxy Warfare in International Politics. Brighton: Sussex Academic Press. pp. 5, 12–13. ISBN 978-1845196271. ^ a b Williams, Brian Glyn (2012). Innes, Michael (ed.). Making Sense of Proxy Wars: States, Surrogates & the Use of Force. Washington DC: Potomac Books. pp. 61–63. ISBN 978-1-59797-230-7. ^ a b Carr, Mike (2016). France, John; Rogers, Clifford; De Vries, Kelly (eds.). Journal of Medieval Military History, Volume 10. Woodbridge: The Boydell Press. pp. 163–166. ISBN 978-1-78327-130-6. ^ Heebøll-Holm, Thomas (2013). Ports, Piracy and Maritime War: Piracy in the English Channel and the Atlantic, c. 1280-c. 1330. Leiden: Brill. p. 8. ISBN 978-9004235700. ^ Watson, William (2003). Tricolor and Crescent: France and the Islamic World. Westport, Connecticut: Praeger Books. pp. 17–19. ISBN 978-0275974701. ^ a b Axelrod, Alan (1997). The Real History of the Cold War: A New Look at the Past. New York: Sterling Publishers. p. 20. ISBN 978-1402763021. ^ Wilde, Robert. "Mutually Assured Destruction." About Education. About.com, n.d. Web. 23 April 2015. .
^ a b Prof CJ. "Ep. 0014: Fall of the Soviet Empire." Prof CJ, 21 July 2014. MP3 file. ^ Curtis, Anthony R. "Mass Media Influence on Society." University of North Carolina at Pembroke, 23 June 2012. PDF file. ^ The Editors of Encyclopædia Britannica. "Soviet Invasion of Afghanistan." Encyclopædia Britannica. Encyclopædia Britannica, Inc., n.d. Web. 23 April 2015. <http://www.britannica.com/EBchecked/topic/1499983/Soviet-invasion-of-Afghanistan>. ^ Masters, Jonathan, and Zachary Laub. "Hezbollah (a.k.a. Hizbollah, Hizbu'llah)." Council on Foreign Relations. Council on Foreign Relations, 3 January 2014. Web. 28 April 2015. .
^ Laub, Zachary. "Hamas." Council on Foreign Relations. Council on Foreign Relations, 1 August 2014. Web. 28 April 2015. <http://www.cfr.org/israel/hamas/p8968>. ^ a b Mumford, Andrew (1 April 2013). "Proxy Warfare and the Future of Conflict". The RUSI Journal. 158 (2): 40–46. doi:10.1080/03071847.2013.787733. ISSN 0307-1847. ^ "War on the cheap? : assessing the costs and benefits of proxy war". repository.library.georgetown.edu. Retrieved 28 September 2015. ^ Jervis, Robert (January 1978). "Cooperation Under the Security Dilemma" (PDF). World Politics. Retrieved 28 September 2015. ^ "How to stop the fighting, sometimes". The Economist. ISSN 0013-0613. Retrieved 28 September 2015. ^ "Iran and Saudi Arabia's cold war is making the Middle East even more dangerous". Vox. 30 March 2015. Retrieved 28 September 2015. ^ Bednarz, Dieter; Reuter, Christoph; Zand, Bernhard (3 April 2015). "Proxy War in Yemen: Saudi Arabia and Iran Vie for Regional Supremacy". Spiegel Online. Retrieved 28 September 2015. ^ "Saudi Arabia, Iran and the 'Great Game' in Yemen". Al Jazeera. Retrieved 28 September 2015. ^ "Operation Rolling Thunder." History. A&E Television Networks, LLC., n.d. Web. 28 April 2015. .
^ "The Soviet Invasion of Afghanistan and the U.S. Response, 1978–1980." U.S. Department of State Office of the Historian. U.S. Department of State, 31 October 2013. Web. 28 April 2015. .
^ Sheridan, Kerry. "War-related deaths near 500,000 in Iraq." Your Middle East. Your Middle East, 16 October 2013. Web. 28 April 2015. .
^ "Syria Civil War Fast Facts." CNN. Turner Broadcasting System, Inc., 13 April 2015. Web. 27 April 2015. .
^ "More than 115 children killed in Yemen war." Aljazeera. Al Jazeera Media Network, 24 April 2015. Web. 28 April 2015. .
^ "Afghanistan sees record high of civilians casualties in five years." English.news.cn. Xinhua, english.news.cn., 19 February 2015. Web. 28 April 2015. .
^ "Fatalities in Terrorist Violence in Pakistan 2003–2015." SATP. SATP, 26 April 2015. Web. 28 April 2015. .
^ "Why Proxy Wars in the Middle East Are (Probably) Here to Stay". Political Violence @ a Glance. 27 August 2015. Retrieved 28 September 2015. ^ Balcells, L.; Kalyvas, S. N. (1 January 2014). "Does Warfare Matter? Severity, Duration, and Outcomes of Civil Wars". Journal of Conflict Resolution. 58 (8): 1390–1418. doi:10.1177/0022002714547903. ^ "Syria: The story of the conflict". BBC News. 9 October 2015. Retrieved 23 November 2015.